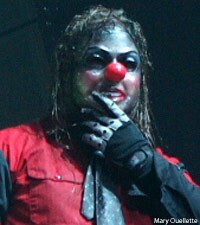 What kind of mutant creature has fallen under the camera lens of Slipknot percussionist Shawn Crahan? It looks like a cross between an Asian black metal bassist and an Insane Clown Posse groupie. Nevermind the garish makeup and the eye-grabbing cleavage -- what's with the eight-inch long right eyelash and that unsightly knot on the top of her head? The title of the shot is 'Just About To ...' which begs the questions, "Just about to what?" and "Just about to with whom?" "This is a chick. I don't know her name," Crahan tells Noisecreep, likely echoing the words of the dude who woke up next to her the next day. The black and white style and the extreme contrast of the shot suggests that something dark and depraved is going on here, and the blurriness makes us think nobody in the vicinity is sober enough to drive. Our suspicions are confirmed by Crahan, who explains that he took the picture when we was hired to do a photo shoot for Minneapolis hellraisers American Head Charge. "They drove from Minneapolis to Des Moines and checked into a hotel," Crahan says. "They were putting out their second record and their concept was to have a drawing or a photo of some sort of a female clown in a nurse's suit with a syringe. I showed up at the hotel, walked in the door. Everything in the hotel was turned upside-down. It looked like they'd been squatting in there for a month." '100 Against' Original photograph by Slipknot percussionist Shawn Crahan. As he surveyed his surroundings he spotted her, the subject of his photographic explorations and fodder for fantasy. "This random woman that they met was definitely down for the party," Crahan says. "She had dressed up. She was beautiful and seductive and scary, and it was clear that she was definitely a clown and was playing the part." Entranced by his female counterpart, Crahan shot and shot and shot. "I got a lot of photos of her, and it's some of my favorite work because it was me looking in through the eye. I chose this one [for 'Clown Exposure'], because it's in black and white, and you can feel that she's right on you -- and right on me. And she's very seductive, but she's also very, very harmful."